I spent a good portion of the game feeling that way as well - it felt like I was uncovering large areas and progressing lots without ever stumbling upon new upgrades! The game is much more freeform than most examples of the genre so you're not doing anything "wrong" as such. I like that you are essentially let loose on this space and have to find your own path through it, but there are times when it would have been nice to be funnelled just a little bit more down a critical path! Ad7 wrote: I feel like I'm missing something here, like I'm perfectly going around places that give upgrades and powers, because I found two more areas tonight, a mine with some crusher things and flippy platforms. I beat a crystal guy who was taking up a bench there. I forget the other area but surely I should have got more powers by now right? I've only got a single nail upgrade, wall jump, some sword charge attack and dash. Am I missing something here? Lots. Just keep looking. You'll find an important one somewhere in that area. That feeling when you die in an unexplored area, miles away from your last bench, with loads of coins. Gah! I got the dream nail by dropping down a pit.. That I'd been to twice before but went left at the bottom instead of one screen right nice to have some actual direction now. Think I'm up to nearly 300 red blob tree things now. After about 10 tries in a row, I beat the Broken Vessel. The trick, as with life in general, was not to get flustered. I tend to dodge away immediately after getting hits on big enemies to avoid any counter strikes. With the Broken Vessel, I'd hit him and dodge away as he was moving around the arena, colliding with him and taking 2 or even 3 points of damage as I flailed around trying to regain my footing. As soon as I focused on fighting the instinct to hit-and-run and only dodged when necessary, the Vessel went down easily. It's nothing major, but I was quite pleased with myself for solving my own problem. Call and Answer wrote: ...It's nothing major, but I was quite pleased with myself for solving my own problem. Welcome back to GR, C&A! 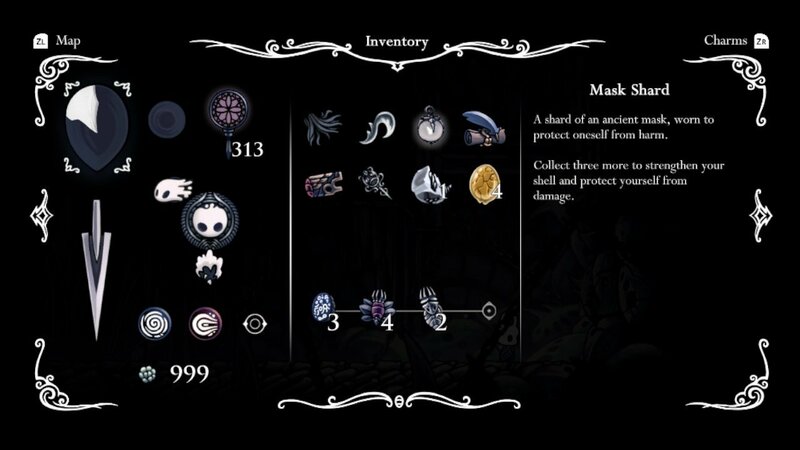 It appears that you took a little break before Hollow Knight got you pressing keys again . I've got the 3 dreamers done. Meaning I finally beat that boss fight. It was a bit crap tbh as I basically tanked it with my extra health, improved nail and a quicker heal perk. There are some dream bosses still to do, if I can be arsed. I was trying the Failed Champion last night and its dreadful. The framerate tanks to a point where its unplayable for me. I've had performance issues as the game has gone on but apart from a couple of isolated boss fights its not been enough to actually affect my enjoyment. 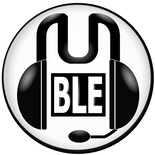 This however is a bloody tough fight made impossible when its stuttering around. I wont see the boss move or attack properly. The stuff falling from the sky doesnt help. Sometimes even attacks dont even happen despite me pressing the button. Its not good enough. I finally found a way into the Hive so I think I've been to all the areas. I've found all the grubs. Might have to start looking at the wiki because the game is both massive and stupidly obscure. I've never had framerate issues during bosses. The only framerate drops I've had, which is quite fun, is when picking up loads of coins at once. I often wouldn't go back to the grub area until I had found around 20 or so grubs, so when I did, the old grub would just shower me with coins. If you leave them and don't pick them up, they continue to pile up. Once he's done, dash through as many as you can and just watch the framerate plummet. Strangely satisfying. I assume finishing a pantheon with different bindings doesn't stack? So you'll have to finish it with all 4 bindings at the same time to truly complete it? I tried it once and got to the mawler thing or whatever it's called on the first one but damn it's tricky. There is a bunch of things to do if you want the true ending. Then there's the DLC. 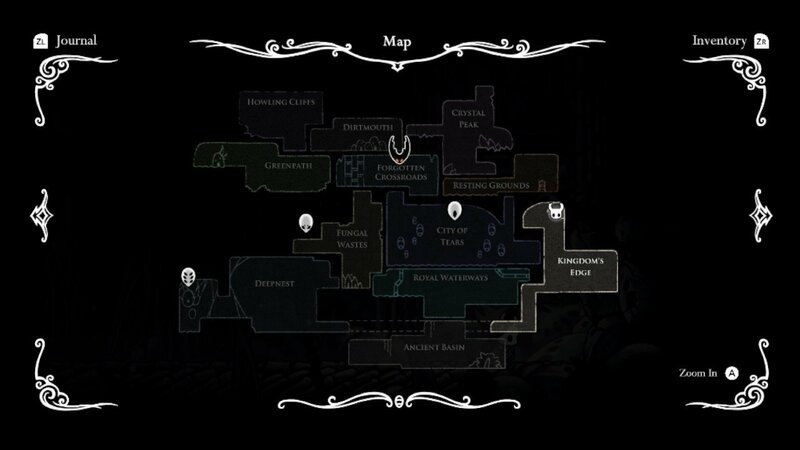 Might be worth saving yourself some hours of exploring and just look up how to get to The Grimm Troupe and Godmaster stuff if you haven't encountered any of it yet. Jezo wrote: I've never had framerate issues during bosses. After my latest session I think there is something seriously wrong now. Its effecting the fight with Grey Prince Zote. All I have to do is splash about in some water and its like the whole thing drops 50% for a sec or two. I'm playing on Switch and docked. I've managed to start The Grimm Troupe one. It's a bit gooseberry fool so far. Go around and fight the same irritating/tedious fight. Seriously, the creature would spend most of the strawberry floating time in walls so I couldn't actually hit him. Then a proper boss fight happened and it was so massive and stuff flying everywhere I had no idea what to do. Ok a bit of investigating..... I was trying the Grey Prince Zote boss fight earlier and really struggling again because of the frame rate. Just closed the game down and launched the game again and BAM. Did it first time and I don't think I spotted one frame drop. So if any of you start having issues try launching the game over again rather then carrying on from where it had been suspended. I've been getting some horrendous button lag tonight, jumps not registering at all or having a good second delay on them. If anyone cares, Axiom Verge seems to be 50% off in the Switch eshop until the 12th - pretty good way to fill the Hollow Knight void with some flawed Metroidvania action. Clarkman wrote: If anyone cares, Axiom Verge seems to be 50% off in the Switch eshop until the 12th - pretty good way to fill the Hollow Knight void with some flawed Metroidvania action. What abilities have you got at this stage? 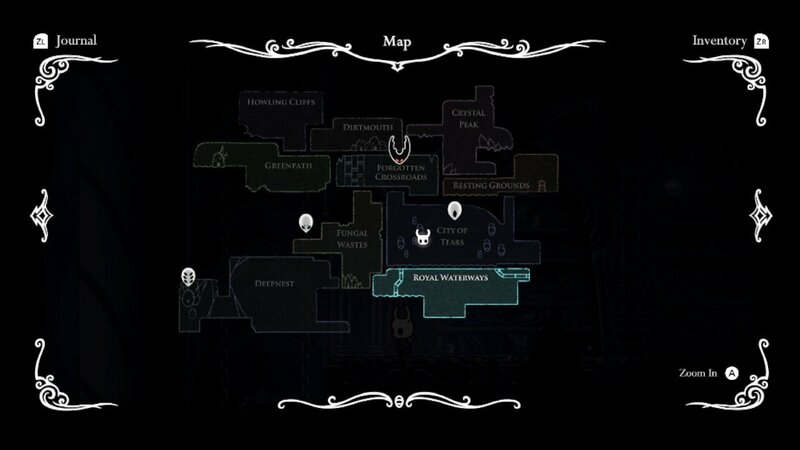 Looking at that map, I think I'm around a similar point but I've got a path to follow. Found the Godmaster section. Had to look up the locations for keys though. Why do devs do this? (also means I've finally opened that door in Dirtmouth after about 500 hours ) Anyway I need to look up exactly what this place wants me to do as the doors confused me. Looked like I was suppose to select things but couldn't. I dunno. Gonna need you to zoom in if you want help.